Words and pictures can help tell a story, but they can’t necessarily capture the soul of something. And it’s very hard to understand the soul of Burning Man without being there. But now I’ve been there. And so has Campbell. And we will hopefully both live better lives because of it. I’ll try and find ways to convey some of the experiences we shared over the last week, camping out on the floor of the Nevada Desert along with 35-45,000 other humans in an exercise in self-expression and self-reliance; I doubt I will be able to do it true justice. 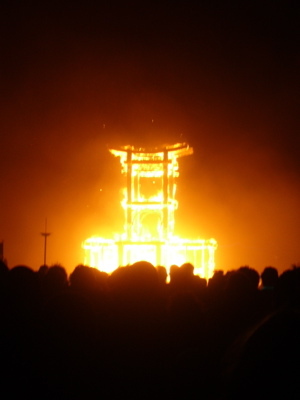 The Temple Burn, shown above, which took place on Sunday night, was a beautiful conclusion to the most beautiful week. Peace.